Model 2419MIC prefabricated modular structure is designed for use as a diesel fuel pumping station for electric power generating facilities. Providing 411 square feet of floor space, the shelter houses diesel fuel pumps, together with associated flow meters, filters, piping, and fan forced heating system. The structure provides safe housing for the pumping operation, while protecting the equipment against weather, theft, and vandalism. The structure is nominally 24 feet in length by 19 feet in width. It is fabricated from heavy gauge steel, structural channel, and tubing. 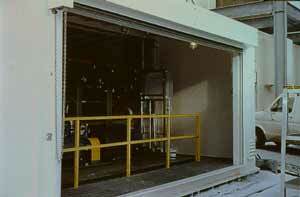 It is equipped with a full-length roll-up door, secondary spill containment sump and galvanized steel walkway. All surfaces are protected with chemical resistant coatings. Environmental controls and safety accessories include a dry chemical fire suppression system, gravity air inlet vents, explosion-proof exhaust ventilation, explosion proof electricals, and fire alarm system. Safety Storage, 2301 Bert Drive, Hollister, CA 95023. Tel: 800-344-6539. Fax: 831-637-7405.